LiPS is based on the notion that phonemic awareness is a prerequisite for literacy and general learning. Phonemic Awareness is the ability to recognize and manipulate phonemes. 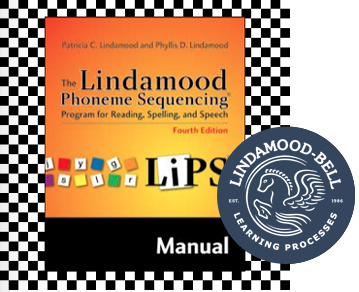 Background: T he Lindamood Phoneme Sequencing, or LiPS, Program is a multi-sensory, process-based intervention program that aims to improve fluency by developing phonemic awareness. Students use articulatory (i.e. kinesthetic) feedback to learn how their mouths produce speech sounds. Becoming acquainted with the feeling of sound production empowers students to self-monitor during speaking, spelling and writing tasks. Ultimately, students of the program become independent competent readers. LiPS is based on the notion that phonemic awareness is a prerequisite for literacy and general learning. Phonemic Awareness is the ability to recognize and manipulate phonemes. People who have not mastered the phonemic inventory and phonology of their native language may struggle with word decoding, spelling, and pronunciation. LiPS is implemented in schools, clinics, or private tutoring settings. Daily instruction is intensive and individualized. Using mouth pictures, colored magnets, and magnets with letters and syllables, sounds are first taught in isolation. Two sound sequence approaches are used in LiPS. In a horizontal approach, older students learn all of the consonants and all of the vowels together before tracking. Younger students follow a vertical approach by learning particular groups of consonants and vowels and then tracking immediately. In tracking, students work on blending sounds and manipulating combinations of sounds using colored magnets; pseudowords are used in order to build reliance on phonology, rather than sight words. With practice, students can work with more sounds and more complex combinations and then move onto the syllable, sight word, and text reading levels. Writing letters on the colored magnets and using the letter magnets can aid the student’s transition from phonemic awareness to phonics. Correcting students’ errors is important in building self-monitoring, self-correcting, and reading independence. Students are guided in comparing their response to the original stimulus, in order to recognize and correct the error. The LiPS program incorporates adaptations, such as using a mirror to provide visual information if a student is struggling with relying on articulatory feedback. The magnets also double as an AAC device and is part of the kinesthetic approach of the program. LiPS technology is currently limited. Online materials and computer programs have been developed, and a future goal is to make the materials more compatible with SMART boards. Cost: Teacher training is $115 per teacher per day and $350 per teacher for materials; school-wide implementation ranges from $35,000 to $50,000 per year. Evidence-based use of letter tiles and pseudowords. Mixed effects on reading comprehension. Time- 80 hours of intensive therapy is suggested. Research demonstrating efficacy of LiPS itself is inconsistent. Additional Information: A National Reading Panel (2000) meta-analysis of 52 studies suggests phonological awareness (PA) instruction positively affects both word and pseudoword reading by teaching the decoding of novel and familiar words.However, LiPS efficacy is inconsistent: McIntyre, Protz, & McQuarrie (2008), and Torgesen et al. (2003). Special thanks to Kayla Johnson, Rhonda Miller, Amanda Khoe and Andrew Angeles. Lindamood-Bell Learning Processes, 2013. http://www.lindamoodbell.com/programs/lips.html. McIntyre, L., Protz, S., & McQuarrie, L. (2008). Exploring the potential of LiPS instruction for beginning readers. Developmental Disabilities Bulletin, 36(1&2), 18–48. National Institute of Child Health and Human Development (April 2000). Report of the National Reading Panel: Teaching Children to Read. Torgesen, J., Wagner, R., Rashotte, C., & Herron, J. (2003). Summary of outcomes from first grade study with Read, Write and Type and Auditory Discrimination in Depth Instruction and software with at-risk children (FCRR Tech. Rep. No. 2).